I participated in a campaign on behalf of Mom Central Consulting for CaringBridge. I received a promotional item as a thank you for participating. When someone in your family or a friend is sick your whole world turns upside down. I’ve had two close family members pass away from cancer. My grandpa had Pancreatic cancer. I’ll never forget the horrible news that came while my husband and I were on our way home from our honeymoon in Europe. I was thousands of miles away and balling my eyes out at the terminal awaiting our delayed flight. I remember thinking, “How could it be? He was had just walked down the aisle with my mom and grandma at my wedding, he isn’t sick!” It wasn’t long after his fight that God decided it was time for him to come home. It was a horribly difficult time and having the love and support from everyone around them is what gets you through each day. Have you or a loved one ever experienced a life-changing illness or event? For more than 15 years, the nonprofit CaringBridge has served as a lifeline of hope, bringing together families struggling with illnesses and tragedies. 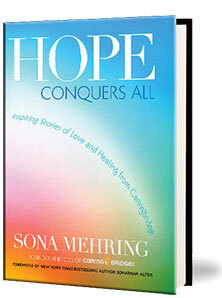 Sona Mehring, the founder of CaringBridge wants to share these important collections of stories to inspire hope through her new book, Hope Conquers All. Ranging from young children with cancer, to adults awaiting transplants, these first-person accounts share the importance CaringBridge had in their personal journeys. For uplifting tales to share with those who are in need of love and support, or even to just reflect on how brave these individuals were through such troubled times, learn more about Sona Mehring’s book and how to purchase here. All proceeds of the book sales will go to CaringBridge. I have several friends and family members that have used CaringBridge as a resource during tough times- it’s been invaluable to them and their loved ones. Thanks for sharing this important info! Cancer has touched my family, too. Horrible disease. I’d really like to read this book.